Objectives: To demonstrate difficulties in diagnosing and treating Addison’s disease caused by tuberculosis. 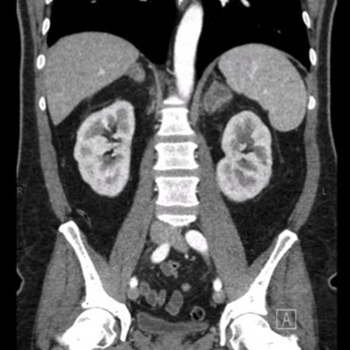 Results: A 62-year-old man presented with gastrointestinal symptoms, weight loss and enlarged adrenal glands. After 2 months of diagnostic tests, a working diagnosis of Addison’s disease due to extrapulmonary tuberculosis was made. Treatment was challenging due to interaction between rifampicin and steroids. Conclusion: Our case illustrates that in non-endemic countries, extrapulmonary tuberculosis still needs to be considered as a possible cause of Addison’s disease. Addison T. On the constitutional and local effects of disease of the supra-renal capsules. London: Highley; 1855. Rowinska-Zakrzewska E, Szopinski J, Remiszewski P, Szymanska D, Miller M, Pawlicka L, et al. Tuberculosis in the autopsy material: analysis of 1500 autopsies performed between 1972 and 1991 in the Institute of Tuberculosis and Chest Diseases, Warsaw, Poland. Tuber Lung Dis 1995;76:349–354. Lam KY, Lo CY. A critical examination of adrenal tuberculosis and a 28-year autopsy experience of active tuberculosis. Clin Endocrinol (Oxf) 2001;54:633–639. Nomura K, Demura H, Saruta T. Addison's disease in Japan: characteristics and changes revealed in a nationwide survey. Intern Med 1994;33:602–606. Zorginstituut Nederland. Rifampicine. Farmacotherapeutisch Kompas; 2018. Available at: https://www.farmacotherapeutischkompas.nl/bladeren/preparaatteksten/r/rifampicine (accessed 26 Mar 2018).